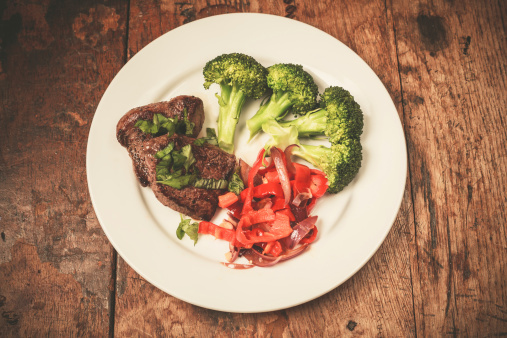 Home » Food and Nutrition » The Paleo Diet: Jeb Bush Did It, So Can You! One of my patients recently asked for my advice on how she could lose 10 pounds before her upcoming wedding. “I’ve tried three different diets in the past year,” she said. “But I can’t seem to stick to a plan!” I get asked for “diet” advice all the time—there are literally thousands of diets, supplement pills, and meal plans to choose from; so how can you find the best plan that cooperates with your body while still fulfilling all of your nutritional and weight loss goals? The first thing I tell my patients is that “dieting” shouldn’t be seen as a temporary solution to reach a short-term goal—or you’ll fall off track very quickly. Whether your goal is to lose weight or improve your energy level, a diet that incorporates healthy, nutritious meal plans needs to be a way of life. Although many health gurus tout new and improved health foods and fancy supplements as part of their diets, I always advise my patients to stick to the basics. That’s why I’m a fan of the Paleo diet. The name “Paleo” comes from our Paleolithic ancestors; the Paleo diet is based on the idea that our bodies are built to consume certain foods, similar to what our ancestors ate, including wild vegetables and animal foods. Unfortunately, our diets are generally different than the simplistic eating style of our ancestors. This mismatch, according to Paleo supporters, is the reason why many modern-day health issues, such as diabetes, heart disease, and obesity occur. The belief is that if we return to our “natural” diets, similar to how our ancestors ate, we will have healthier digestive systems and our bodies will be filled with more strength and energy. All grains—humans lived as far back as 150,000 years ago, but the increase in agricultural production didn’t occur until about 10,000 years ago, which means that our species had to survive about 140,000 years without any grain! The former governor of Florida is expected to seek the Republican nomination for U.S. presidency in 2016—and he’s certainly making an effort to look presidential. Jeb Bush has admittedly struggled with his weight throughout his life. At 62 years young, he has finally realized that if he wants to live out a long, healthy life—and potentially run to become the President of the United States—the people of America need to know that he’s going to be around long enough to make a difference. Reports have stated that Bush has lost almost 30 pounds since he started the Paleo diet in December 2014. His healthy, new lifestyle includes regular exercise and daily laps around the pool. How Much Will the Paleo Diet Cost? For one person embarking on the Paleo diet, it will cost, on average, around $70.00 to $75.00 a week. Don’t get discouraged by that ballpark figure! The first week of the diet tends to be a tad expensive, because some of the Paleo basics may not be found in your home. Once you buy the items in bulk, you will be able to shred the cost in half, if not more. 2. In a large bowl, mix the stock, coconut, and garlic together to create a sauce. 3. Melt the cooking fat in a skillet over the grill. 4. Add the mushrooms and asparagus to the skillet and cook for four minutes. 5. Add the sauce to the skillet and cook for three minutes. 6. Season both sides of the steak with sea salt and black pepper. 7. Grill the steaks and cook for about three minutes per side. 1. Preheat the grill to 350 degrees Fahrenheit. 2. Season the steak with the sea salt and pepper and let it sit for 10 minutes. 3. Sauté the garlic with coconut oil for one minute in a saucepan over a medium- hot grill. 4. Stir the aminos, water, and lime juice, and then season it with the salt and pepper. 5. Bring it to a constant boil, stirring it often, and let it continue boiling for two minutes. 6. Grill the steak for five minutes per side. 1. Warm cooking fat for the Brussel sprouts in a cast-iron skillet over medium heat. Add the garlic and cook until golden (about three minutes). 2. Add the Brussel sprouts to the garlic, season it to taste with the salt and pepper, and cook until it’s soft (about 15 minutes). 3. Warm the coconut oil in a cast-iron skillet over the medium-hot stove and then stir-fry for six minutes. 4. After removing the beef, cook the onions, broccoli, and red peppers for five minutes. 5. Place the beef on the skillet. 6. Take a small bowl and mix the water, coconut oil, the aminos, and the ginger and garlic. 7. Pour the mixture in the small bowl into the skillet with the beef. Cook it all together for about three minutes. 1. Cook the ground beef in a skillet on medium heat. 2. In a large saucepan, sauté the garlic in olive oil over medium heat. Cook for two minutes. 3. Add the mushrooms, celery, onion, and carrots to the saucepan and continue cooking for 10 minutes. 4. Add the tomatoes to the ground beef. 5. Add the bay leaves, parsley, and thyme to the ground beef. 6. Season with the salt and pepper; then reduce the heat and let it simmer. Stir it occasionally for a few hours before serving. 2. Place the chicken in a marinating container and season each breast with lemon juice, onion powder, Italian seasoning, and garlic. 3. Let the chicken marinate for 20 minutes. 4. Cook the chicken on the grill for about 15 minutes per side. “Paleo Diet Recipes,” Paleo Leap web site; http://paleoleap.com/paleo-diet-recipes/, last accessed May 14, 2015. Kimble, L., “Jeb Bush Adopts a Paleo Diet – and Drops 30 Pounds,” People web site, April 25, 2015; http://www.people.com/article/jeb-bush-loses-weight-paleo-diet. Kamb, S. “The Beginner’s Guide to the Paleo Diet,” Nerd Fitness web site, October 4, 2010; http://www.nerdfitness.com/blog/2010/10/04/the-beginners-guide-to-the-paleo-diet/. “What is a Paleo Diet?” Paleo Leap web site; http://paleoleap.com/, last accessed May 14, 2015.